Greg is a studio artist that works in 2D & 3D formats with clay and paint being the primary materials. He received his BA in art from Buena Vista University. 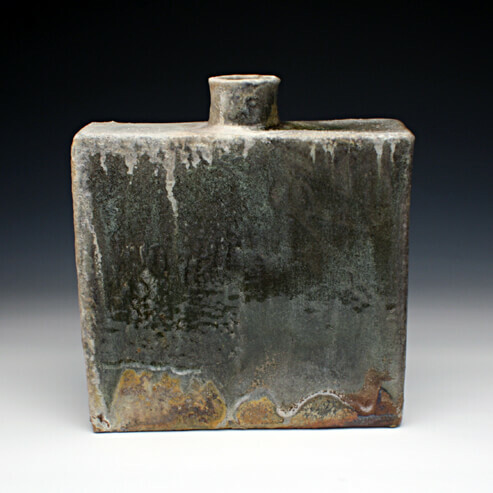 Greg studied ceramics & painting in graduate school at the University of Iowa’s School of Art & Art History where he received his MA and MFA in ceramics. Greg has been a resident artist at the Archie Bray Foundation for the Ceramic Arts and Watershed Center for the Ceramic Arts. He has taught ceramics as a Visiting Professor at Kent State University and as an adjunct at The University of Iowa’s School of Art & Art History. He was also an Assistant Professor of Art at Iowa Wesleyan College. Greg exhibits nationally and lives in Iowa City, Iowa. My creative endeavors include ceramic sculpture, pottery and painting with an unrefined quality derived from a primitive instinct, freedom of the mind and my quest for provocative images. What drives me to express my unique viewpoint is stretching the materials I work with and interjecting the use of vivid color to the art work. I gather a lot of my inspiration for creation from several different sources. It comes from abstract paintings, folk art, sculpture, ceramics, outsider art and my creative grandparents. The sculptures are created from thrown forms off the potter’s wheel and shapes that I mold by hand. I like to fabricate a couple dozen forms and begin to pick them up and compose them into sculptures spontaneously. I often choose to interject my personality, lifestyle, and a perverse sense of humor into the sculpture. I like to paint on large ceramic jars, cardboard, wood and canvas. The subject matter of the piece usually ends up with a narrative theme. The theme can come through a sculpture directly, on the surface of a jar or on the flat surface of a painting. My ceramic work is fired in different types of kilns and atmospheres. The ceramic sculptures are typically fired in a kiln fueled by wood. The use of the wood kiln as a tool to help make my creations has been an important aspect in giving birth to my ceramic sculpture. I find this ancient method of firing exciting, particularly when it comes to filling a wood fired kiln with my sculpture. I believe that losing control of the results of the sculptures with an unpredictable atmosphere and flame pattern just works well with how I manipulate the clay and envision these sculptures. My large jars are decorated with colored slips and are fired with electricity. The electric kiln is a very controlled atmosphere so I can achieve a very clean and fairly predictable decoration. I enjoy using both methods of firing to achieve the different results that I desire. There are many artists in differing fields that ignite my interest. The paintings of Dubuffet, Twombly. Pollock and Basquiat, the sculptural work of Miro, Arneson and Oursler and the raw energy of the ceramic work by Voulkos are some of the artists that I admire. I also marvel at the art work of folk artists, outsiders and graffiti artists. The personal styles that each artist portrays and the commitment they have made to being creative moves me emotionally to become an imaginative artist.